Most Rutgers employees will enjoy a long holiday break this year, but some of our members working in Cooperative Extension, based in county offices will be working on the four floating holidays (Dec. 27–30 this year.) County‐based employees in the URA unit who are assigned to offices which follow a holiday schedule that is different than that set forth in Article 14 “Holidays” section of the 2007–2011 URA‐AFT Administrative Unit Contract are entitled to a day and a half of holidays for each of those days when they work. 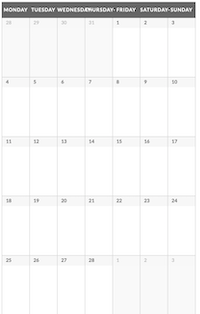 The most common county holidays are Washington’s and Lincoln’s Birthdays, Good Friday, Columbus, Veteran’s and Election Day. However, if your county does not observe all of these, you should request personal holiday time from your supervisor, at the rate of 1 1/2 days. Read the 2008 side agreement here. The new policy will establish that: “Requests for vacations shall not be unreasonably denied.” Many members have reported that supervisors have refused requests for vacation so often, and so unfairly, that they end up carrying over vacation time until they lose it. URA unit members (but not the non‐unionized supervisory and professional staff) will also gain important protections against forfeiting vacation days, interrupted vacations, and managers who will not approve requests for vacation. Some members have also been called while on vacation by supervisors who want them to return to the office, sometimes for trivial reasons such as: “I forgot my password.” The URA’s letter of agreement states that employees may be called back from vacation only in an emergency where they are the only employee who can remedy the situation. The agreement goes on to guarantee that an employee who is unable to return from vacation, in case of an emergency at work will not be subject to discipline. Employees who make a written request for vacation will be entitled to a written response within 14 days of their request. 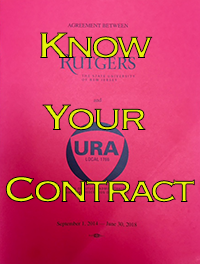 The letter of agreement was negotiated by a team made up of President Lucye Millerand, Newark Campus vice president Darlene Smith, New Brunswick executive board member Joyce Sagi and Camden steward Cynthia Davidson. Many URA stewards and members provided input on their needs and concerns. You should soon be able to find the new vacation policy 60.3.10 in the university policy library, and read the URA agreement here.